The Winchester community is fortunate to have access to acre upon acre of trails in the woods. 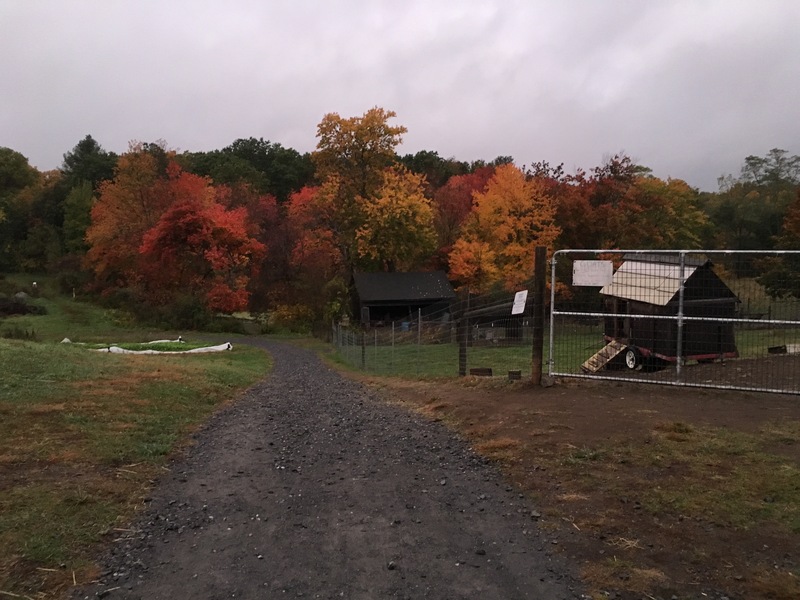 At Wright-Locke Farm, our property abuts the Whipple Hill conservation area. 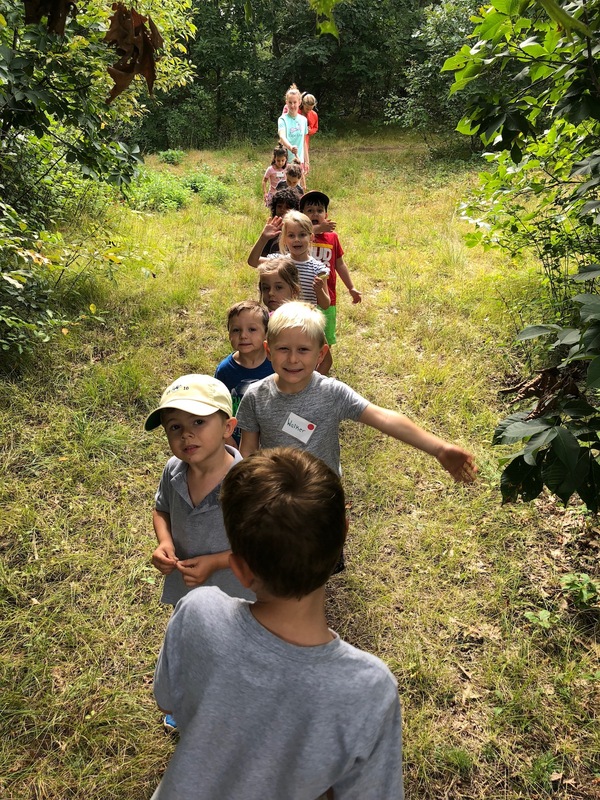 During the 2018 season, the Youth Education Program made a conscious effort to spend more time in the forest by incorporating daily woods walks into our sessions. We enter the woods next to the small pond near the bee boxes. We first use our eyes to take in our surroundings. As quietly as we can, we walk on the path alongside the long edge of the pond. What colors do you see? With younger groups, we bring color swatches to help narrow their focus. Once we reach a designated meeting spot, we discuss what we saw. Green leaves, brown dirt, blue sky, white clouds. 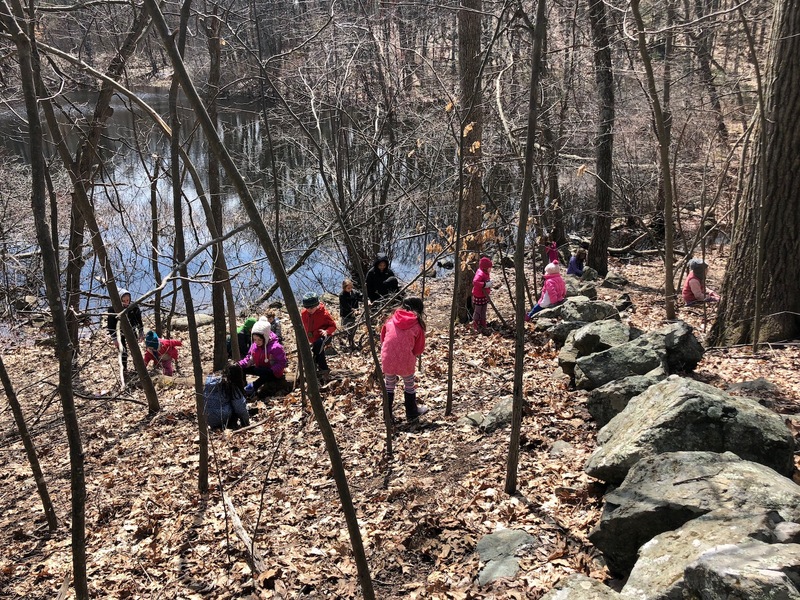 Once a child pointed out a piece of blue litter on the ground, which led to a discussion about the importance of “leave no trace” and why we should keep our forests clean. What do you hear? We do a mindfulness listening activity called “Fistful of Sounds”: everyone closes their eyes, silently raises a hand in the air, and puts one finger down with each new sound they hear until they have a fistful of sounds. This exercise spans all age groups. 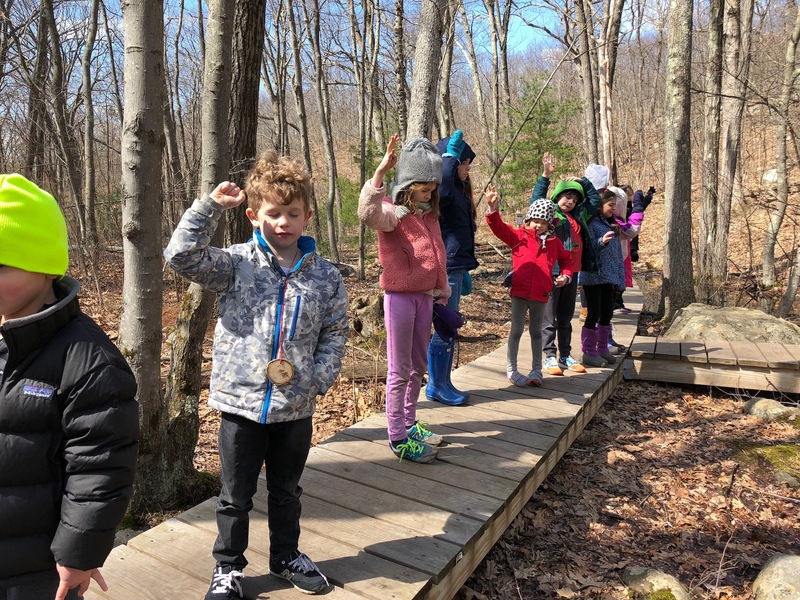 It is endearing to watch preschoolers as they open and close their whole fists with each sound, and encouraging to see reluctant 5th graders silently listen and wholeheartedly participate. We hear nature sounds: leaves rustling, branches cracking, bird chirping. We hear human sounds: planes flying overhead, a car beeping, the tractor plowing. This is to practice being in the “here and now”. Starting at a young age, children and their families are constantly on the go, oftentimes going from one activity to the next. Even taking a minute or two to be present in the moment makes a positive difference on one’s state of mind. As we continue down the path into the woods, we come to a large clearing. This is where we construct our fairy house city. I’ve found that fairy houses are a great equalizer. No matter your age, and whether you’re using your imagination or engineering skills, everyone can participate in some way. I watch as children create new friendships, share, and resolve conflicts. After a set amount of time, we take a tour and practice listening while others tell the group about their creations. We move along the path, making our way toward Locke Pond. I listen as the children chatter away, talking about whose birthday party is coming up, what school they go to, or a cool plant they just discovered. Conversation comes naturally to children no matter where they are. In adults, conversing while walking seems to happen more easily. Although seemingly mundane, walking is a shared activity and fosters a connection in that regard. We are also less focused on our body language (i.e. What do I do with my hands? Am I making too much eye contact?) and can actually think about the conversation itself. There are no awkward silences like when we are sitting face-to-face since conversation is a secondary activity to walking. Despite some resistance, we go up the hill. Everyone (myself included) is huffing and puffing to get to the top. We discuss the importance of physical activity and making our bodies work hard. It is easy to get exercise when you are doing something enjoyable, and where it is not the primary goal. After we make our way down the other side of the hill and back toward the farm, there are some grumbles of feeling tired, feet hurting, being hot. I remind everyone how close we are to the farm, and how there is value in feeling uncomfortable sometimes (within reason, of course). I read that “the more discomfort you introduce into your life, the more your comfort zone will expand”; I feel strongly about instilling this at a young age, and keeping it in mind as adults. If you slowly introduce discomfort, more opportunities will arise as your comfort zone expands. As a native New Hampshirite, I have spent much of my life in the woods: hiking, playing, skiing. A season full of walks in the woods at Wright-Locke Farm reminded me of their importance. There are constant learning opportunities for both children and adults, as well as physical and mental well-being benefits. So, whatever the reason, take a walk in the woods. Bring a friend, spouse, child, grandchild, niece, nephew, dog, or nobody. Go for a short walk for 5 minutes, or a big hike for 6 hours. Challenge yourself or take it slow. Go in the rain, snow, or sunshine; when it’s cold or hot. Go with the flow, and take things as they come. You never know what you might end up experiencing, learning, feeling. 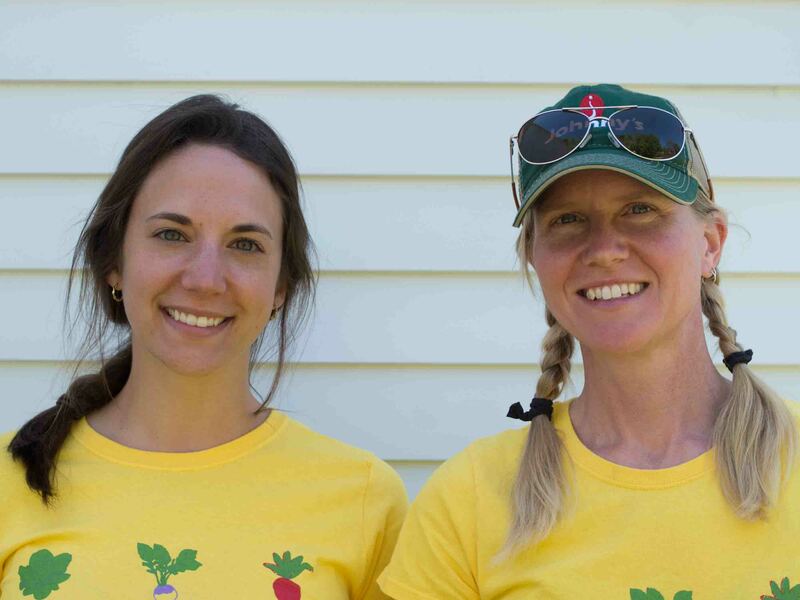 Thank you Becca for your time at Wright-Locke and this lovely piece about one of your favorite things to do with the kids in the youth programs. The best of luck to you and have fun with where the wind takes you!